Kirawira is situated on a hilltop that overlooks the vast plains of the Western Serengeti. The building style and furniture have been styled on the Victorian era and the open-sided architecture of the public areas keeps the guests constantly in touch with nature. The dining room, lounge and bar are situated in a large tent with raised wood flooring. Accommodation comprises of 25 tents that all have a sweeping view of the Serengeti plains, an en suite bathroom with shower only facilities and a private balcony. The tents are also equipped with a dressing table and writing table, a wardrobe, shaver outlet and mirror, his and hers bathroom vanities, a small table and chairs on the viewing deck and hammocks on request. Daily game drives are done on the vast grasslands of the Serengeti where a variety of animals roam, including the big five. Guests visiting Kirawira may even be treated to one of the biggest wildlife spectacles on earth: the annual great migration of millions of wildebeest, zebra and gazelle. The lodge has built its own game viewing blinds on the banks of the Grumeti River, from which guests can view the great Grumeti crocodiles and other game that visit the river for a drink. The lodge offers walking safaris, bush dining and sundowners. Fishing trips to Lake Victoria and balloon safaris can be arranged at an extra charge. 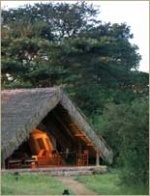 Located in a secluded valley in the Serengeti lies the tented Grumeti River Camp. It is nestled beneath tall trees along side a tributary of the Grumeti River. Crocodiles lie awaiting the great migration as wildebeest and other herbivores try to make their way across. Other animals to see in this area include hippos and high concentrations of cheetah. Grumeti River camp offers you ten spacious tents on raised platforms, with en suite bathrooms and open top showers giving great views of the stars. The rooms are made of cream and ivory interiors, a colorful bed, offset by a wooden headboard and you have a view of the waters edge from your room. If you’re not out on a game drive you’re spending your day relaxing in the plunge pool or sipping sundowners in the lounge or bar. Gourmet Pan African cuisine is served in the open-air boma, and private dinners may be arranged for special occasions. Grumeti is ideal for honeymooners or for celebrating a special occasion. The Mbalageti Serengeti is situated on the Mwamyeni hill and offers a breathtaking panoramic view of the Serengeti plain lands and the Mbalageti River. Sunset or sunrise, each side of the hill accommodates 12 of the 24 luxury tented chalets. 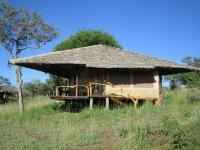 With a structure of local rock and wood, these canvas fitted chalets are the perfect way to relax after a day of game viewing. All chalets have a bathroom with luxury amenities The private veranda with its cooling thatch roof is a private oasis and works as an extension of your bedroom in the wild. There are also two exclusive suites with a little extra of everything, and a private outdoor bath right in the wild. There is a swimming pool made out of local rocks and situated on the edge of the hill. With a 360 degree view of Serengeti, the pool will cool you off after a rough and dusty day among the wildlife. Breakfast, light lunches and dinner, with influences from both the Serengeti environment and continental cuisine are served in the restaurant. The bar, situated in the centre of the main building, is the natural meeting place and heart of the lodge.